History What Happened When Shackleton Was Stranded In The Antarctic For Years? Few exploits of the 20th century could match the courage and perseverance of the Shackleton expedition. Ernest Shackleton became the ultimate model for crisis management when his ill-fated 1914 Antarctic expedition met with disaster. His ship, the Endurance, was stranded amidst the expanding ice floes of the South Atlantic. Initially forced to abandon the vessel (which would eventually sink as a result of the hull being crushed by pack ice), Shackleton established a series of temporary camps on the ice, in the hopes that his party would eventually drift closer to civilization. When this failed, Shackleton was forced to abandon most of his group on remote Elephant Island and attempt a 700-nautical mile journey to the populated outpost of South Georgia Island. The plan, a long shot at best, called for him to then return to Elephant Island with a ship to rescue the remainder of the expedition. Shackleton and five other men successfully navigated a 20-foot lifeboat across open ocean for 15 days and reached South Georgia Island. Having landed on the remote southern side of the island, Shackleton and two others then traversed a rugged 20-mile route to the tiny port of Stromness. The three other men were quickly rescued from the south side of the island, but it would take almost five months before Shackleton would successfully rescue all 22 men that he had left behind on Elephant Island. Shackleton died of a heart attack in 1922 and slipped into obscurity until the sheer magnitude of his inspirational journey returned him to his current status as a popular culture icon of bravery and leadership. Some facts about his incredible mission illuminate why his return to prominence was so well-deserved. Because both Roald Amundsen and Robert Scott had already reached the South Pole, in 1914, Ernest Shackleton proposed to make the first continental crossing of Antarctica, an unprecedented mission. So lengthy was this trek that Shackleton assembled one team he would lead from South America and a second team that would leave from Tasmania and land on the opposite side of the continent along the Ross Sea. Shackleton would not be able to carry enough supplies to make it completely across Antarctica; the Ross Sea party would have to trek almost a third of the way across the continent in order to set up the necessary supply depots. This whole plan was rendered impossible by Shackleton's failure to reach Antarctica before his ship became trapped in the ice, preventing him from landing at an appropriate site. Shackleton's 1914 Imperial Trans-Antarctic Expedition was beset with problems before he even reached his intended landfall at Vahsel Bay. In January of 1915, unusually cold temperatures precipitated an increase in the pack ice around the ship, the suitably named Endurance, and less than 100 miles from land, the ship became completely immobilized in solid ice. Two days were spent attempting to chop a passage through this barrier to no avail. Even worse, the ship was also moving away from its goal, as the Endurance was at the mercy of the drifting ice floe. 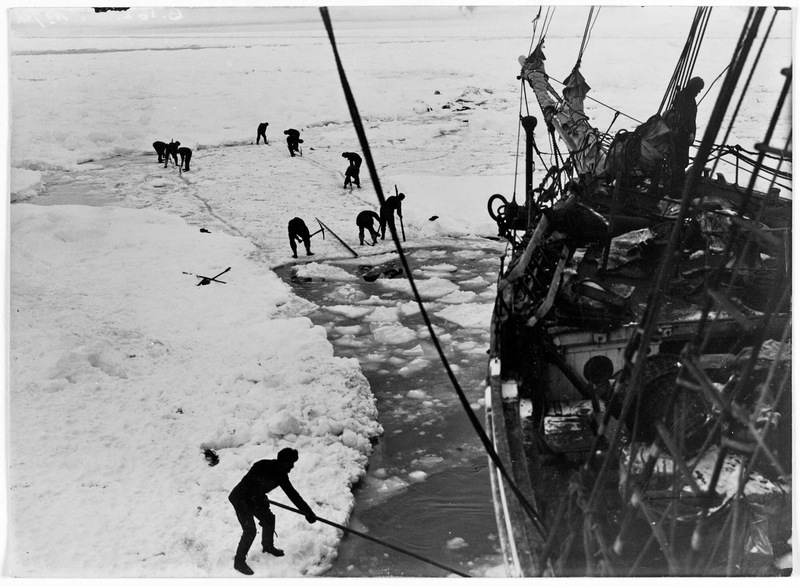 With temperatures routinely hitting -20 degrees centigrade, (-4 F) Shackleton would not be able to reach land until the ice melted, which would potentially take months. Shackleton's dilemma was not unprecedented. A 1911 German Antarctic exploration commanded by Wilhelm Filchner had also been trapped for six months before enough ice melted to allow his ship, the Deutschland, to escape and return to South Georgia Island. However, Shackleton also had to prepare for the possibility that the ice might begin to exert pressure on the sides of the ship. He removed weight from the sides of the ship, hoping this would allow the Endurance to rise in the event that the ice began to push together, keeping the vessel intact as opposed to being crushed. Beneath the frozen ice, sea currents exerted tremendous force that pulled the ice floes and Shackleton's ship for many miles. Frequent blizzards and freezing wind also impacted the ice. Shackleton and his crew could only wait. "The ice is rafting up to a height of 10 or 15 ft. in places, the opposing floes are moving against one another at the rate of about 200 yds. per hour. The noise resembles the roar of heavy, distant surf. Standing on the stirring ice one can imagine it is disturbed by the breathing and tossing of a mighty giant below." By the end of the month, the ship began to sustain serious damage to its stern. Within a matter of days, it was clear that the Endurance was not going to make it. On October 27, Shackleton gave the order to abandon ship.